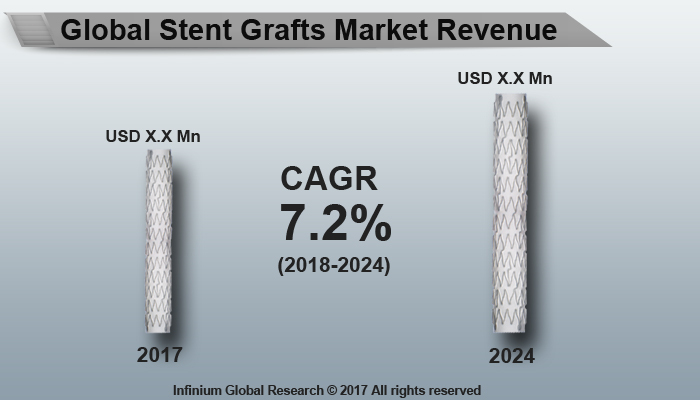 A recent report published by Infinium Global Research on stent grafts market provides in depth analysis of segments and sub-segments in global as well as regional stent grafts market. The study also highlights the impact of drivers, restraints and macro indicators on the global and regional stent grafts market over the short term as well as long term. The report is a comprehensive presentation of trends, forecast and dollar values of global stent grafts market. According to report the global stent grafts market is projected to grow at a CAGR of 7.2% over the forecast period of 2018-2024. The stent grafts is tubular structure made up from two parts stent and graft. The stent is a metal mesh structure used to provide the support to the graft. The catheter is used to deliver stent in the artery for supporting the weak spot called aortic aneurysm. This procedure of treating aortic aneurysms by using stent-grafts is called as EndoVascular Aneurysm Repair. The stent grafting is also used to treat some complex diseases such as pararenal aneurysms & juxtarenal as well as iliac disease. The report defines the stent graft market on the basis of application such as Abdominal Aortic Aneurysm and Thoracic Aortic Aneurysm. Now-a-Days, the number of people are suffering from the cardiac disorder owing to the unhealthy diets and the physical inactivity among the population. The growth of stent grafts market is driven by the factors such as rising adoption of EVAR procedure to treat aortic disease and rising demand of slightly invasive endovascular surgeries. In addition, rising aging population and correspond rising occurrence of the cardiac disorder are expected to enhance the demand of stent graft over the forecast period. Among the regions, North America dominates the market of stents graft. The high occurrence of aortic aneurysm in the U.S. citizens contributes in the market growth of stent grafts in North America region. Asia Pacific region is projected to grow at the highest CAGR during the forecast period, 2018-2024. The report on global stent grafts market covers segments such as, applications. On the basis of applications the global stent grafts market is categorized into abdominal aortic aneurysm and thoracic aortic aneurysm. The report provides profiles of the companies in the global stent grafts market such as, Bolton Medical, GRIKIN Advanced Materials, LifeTech Scientific, AptusEndosystem, Johnson & Johnson, Lombard Medical Technologies, Terumo, TriVascular Technologies and WL Gore & Associates. The report provides deep insights on demand forecasts, market trends and micro and macro indicators. In addition, this report provides insights on the factors that are driving and restraining the global stent grafts market. Moreover, IGR-Growth Matrix analysis given in the report brings an insight on the investment areas that existing or new market players can consider. The report provides insights into the market using analytical tools such as Porter's five forces analysis and DRO analysis of stent grafts market. Moreover, the study highlights current market trends and provides forecast from 2018-2024. We also have highlighted future trends in the stent grafts market that will impact the demand during the forecast period. Moreover, the competitive analysis given in each regional market brings an insight on the market share of the leading players. This report will help manufacturers, suppliers and distributors of the stent grafts market to understand the present and future trends in this market and formulate their strategies accordingly.